Rare and expensive, precious metals such as platinum, rhodium and palladium are used extensively as catalysts on a large scale in preparing pharmaceutical and agricultural chemicals, as well as for applications in energy sciences. For example, platinum catalysts effectively break the H-H bond of hydrogen in clean, efficient fuel cells. However, the need for platinum limits fuel cells from contributing as effectively to the global energy solution. A new book edited by Dr. Morris Bullock of Pacific Northwest National Laboratory summarizes the progress and challenges of designing catalysts from less expensive, more abundant metals. The handbook, Catalysis without Precious Metals, is written for chemists in industry and academia. 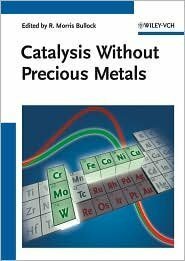 The 306-page hardcover book summarizes recent progress in the field, pointing to how new catalysts may ultimately supplant precious metals in some types of reactions. Also, the book goes on to highlight the remaining chemical challenges and areas in need of further study. The book was written by experts from the United States, Canada, the United Kingdom and China. Bullock was asked to edit because of his expertise in homogeneous catalysis, which has both the feedstock and catalyst in the same phase. Bullock's research focuses on reactivity of metal hydrides, including the transfer of protons, hydrides, and hydrogen atoms. He has also made substantial contributions to developing molecular catalysts that create and use hydrogen as fuel. Bullock currently serves as the Director of the multi-million dollar Center for Molecular Electrocatalysis. Bullock RM (editor). 2010. Catalysis Without Precious Metals. Wiley-VCH, Weinheim, Germany. ISBN: 3527323546. Order copies from Amazon.com, Barnes and Noble, or other book retailers.